West Side Story: A Story of Love, Loss and Male Bravado — Harpy. From outside the theatre, the orchestra strike up Berstein’s rousing overture. The small stage is crowded by eerie entrances and exits. Jets, Sharks; Americans, Puerto Ricans; Men, Women: this is a land of opposites brought together in dissonance. The opening sequence lays the guidelines for a musical of stylised movement sequences over dance numbers. The Royal Exchange arrangement necessitates a pared back musical adaptation, free from movie-style sets, lavish costume changes and sequins galore. A few simple, but very astute, set additions transform the space: two steaming manhole covers embedded into the stage floor and a crosswalk that lifts into benches for the gang to loiter on. Suddenly we’re on the isle of Manhattan. 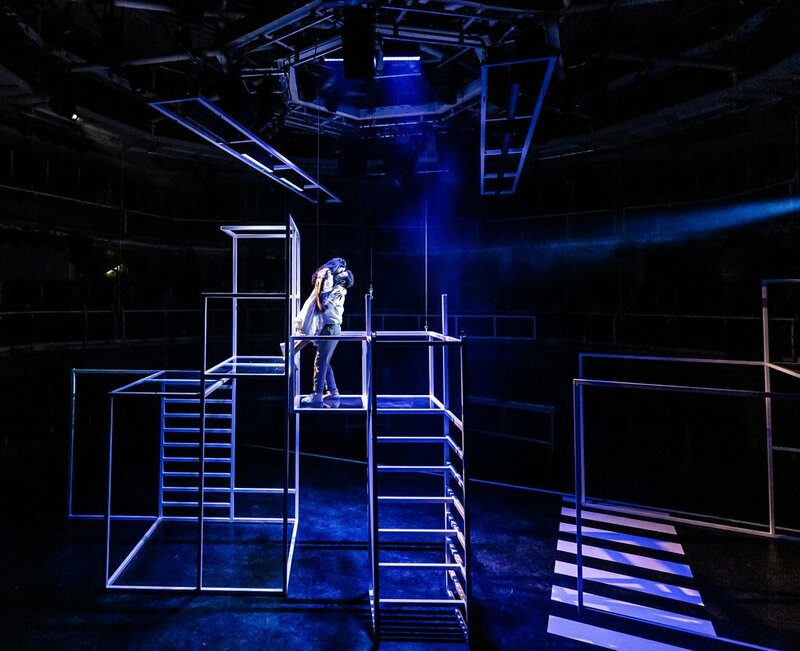 As the usually round stage is pinched at two sides, the set is dominated by two hollow scaffolding blocks at either end. The set comes to life as the gang members hang from the scaffolding, like oddly balletic caged animals. Anna Fleischle’s design is striking yet simple and functional, forcing the cast to define the space through movement. When the sparkle of a Broadway set is stripped away, this musical relies on honest, believable moments enshrouded in song. Andy Coxon, as Tony, manages some difficult solo numbers with enthralling ease. His velvet voice wraps around each note effortlessly, mirroring his understated, honest performance. He isn’t strutting for an audience’s benefit; rather we look in on a star-crossed lover grappling with his emotions in solitude. As Juliet to Coxon’s Romeo, Gabriela Garcia performs Maria with bucketloads of childlike naivety. Reflecting the original Broadway production, this show leaves the lead female offstage for so much of the action that revolves around her. When she does take to the stage, Garcia is the very picture of Latino innocence. Her native Spanish trill and girlish giggle build a sincere characterisation, where musicals so often demand a caricature. As she reaches for impeccably high soprano notes throughout, Garcia’s Maria is a slightly shaking deer in the headlights. She fits the archetype where I had hoped she might break out as a strong, modern woman. Yet, at the production’s two tragic climaxes, she does burst forth. This howling, woman scorned finds her fire and brings the audience to tears. As an enthusiastic fan of the classic 1961 film version, I was quite surprised by the refiguring of America. This iconic stand-off sees an all-female stage for one of the few moments in the show. Yet, in pitting the women against one another, the scene loses much of the sass and sisterhood that the movie scene breeds. Having said that, I certainly don’t consider myself to be a movie purist. Indeed, some of the crowning moments of this production are bathed in innate theatricality. In these moments, the show is enriched by its removal from naturalism. Sarah Frankcom’s reimagining of Somewhere creates a moving love scene without stranding the lovers on stage alone again. As Maria and Tony share a silent moment, their intimacy is mirrored by the coming together of both gangs in song. Led by Emily Langham (who delivers a charming performance as Anybodys throughout) the company serenade the lovers, the audience and the utopian possibility of peace. Harmony and abstract movement create a beautiful, albeit chilling, atmosphere. This adaptation stands apart for this singular, poetic moment promising the chance of a ceasefire. Yet, the ethereal appearance from the dead rivals contorts the scene back to reality. A similarly theatrical highlight follows, from the comedy stylings of the Jets. As the boys address ‘Officer Krupke’ in song, they make a stirring comment through politicised playfulness. The striking visual impact of police tape transforming into marionette strings lingers far beyond the fun-loving scene. Outside of the musical numbers, the cast do well to navigate a script littered with unnatural phrases. (I’m quite done wincing at the word “Daddio”.) Whilst Arthur Laurents’ book and Aletta Collins’ choreography require clearly stylised gang member cartoons, the characters are nicely underplayed. Even Fernando Mariano, as Bernardo, manages to own his flamboyant suits and never feel like a caricature. He commands the stage in very few lines. By his side is Jocasta Almgill in the demanding role of Anita. This is my first musical in the round and the ensemble deftly project their performance 360-degrees. The space ignites an intimacy with the characters as you feel the breeze from their swooshing skirts and the palpable intake of breath at the moments their hearts break. This production marries a disparate concoction of styles: it is at once minimalist and flamboyant. Theatrical liberties are taken alongside silver-screen moments of nuanced performance. It is both impressive and familiar; it exudes energy and then ends with an eerily silent stage. Yet, for all the reconfiguration of the space, the production stays remarkably true to the original. Is it even possible to bring a ‘love at first sight’ story into the Tinder-dominated age in which we now live? Perhaps the show is indelibly written so the male-only scenes carry the most clout. West Side Story is very much of its era, where racial and gender divides are almost indestructible. But that’s not to say that we can’t enjoy singing along for days after the show! West Side Story plays at Manchester’s Royal Exchange Theatre until 25th May. For more information and to book tickets, visit the RX Theatre website.